My friend James and his Japanese wife Sachiko have recently moved to near Ealing. On Sunday this provided the perfect justification to make the long journey across town on the Central Line to a well-regarded little Japanese restaurant called Sushi-Hiro, in Ealing. While I like sushi and sashimi I don't often have it in London as it's often either not that good, or if it is, it's rather pricey. Those in the know agree that raw fish and rice in London does not reach the level of that in New York, let alone in Japan itself. Sushi-Hiro is good though, rather good indeed and a bit of a bargain at that. 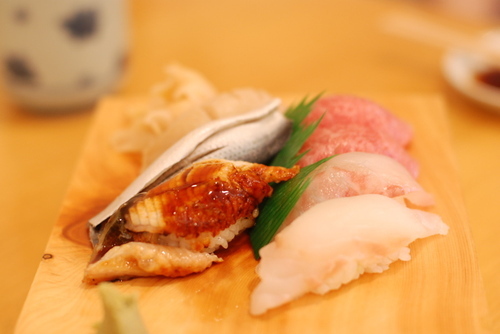 From bottom left, clockwise, mackerel - actually delicately marinated rather than completely raw. Then fatty tuna - a thing of beauty . . . the delicate natural fat, lacing the meat means that it just melts in your mouth . . . a rather unexpected sensation if you've never had this kind of fish before. On top there are some spotted prawns, these are very soft and slightly unctuous, underneath those, a sliced scallop and sea bass, the latter offering a less giving texture. All good. 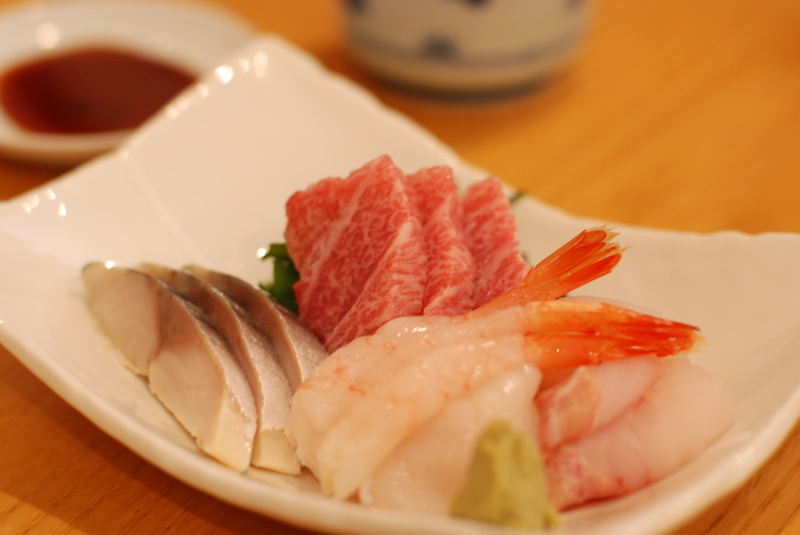 I'm no sashimi expert, but this was certainly better than other places I've been in London, including Zuma . . . this latter comparison may not be a great indicator of quality, but this quality and these species are much more expensive there and many other places. Next we moved on to a selection of nigiri - where the main item is lain across a compressed finger of rice. In the first plate, the turbot shone (at a remarkable £1.50 a piece). You can see our second round of nigiri below (from bottom right, clockwise, freshwater eel, spotted sardine, geoduck, two pieces of tuna, sea bream and turbot. The geoduck is somewhere is quite firm but noticeably and nicely clammy (tasting like a clam, which it is, rather than being wet and horrible). The sardine was terrifically favourful. For three of us, with Kirin beer and green tea this came to a remarkable £64 (it's cash only though, so watch out). Service is impeccably polite as well as efficient. All the fish is from the Japanese chain of fishmongers, Atari-Ya - that's also well worth a visit if you like fish. This restaurant is in an are of London with a large Japanese contingent and so serves as taste of home for them as well as a fine neighbourhood restaurant for everyone, but also one worth making a journey to visit. There's another Japanese restaurant (relatively new) just down the road - I think it's called Kiruku. It's not cheap but it's always packed with the local Japanese crowd. The food is pretty good though.